Swanton freshman Julia Smith clears the bar in the girls high jump at the state track and field championships on Friday. Smith placed fourth in Division II after she cleared a height of 5’4”. 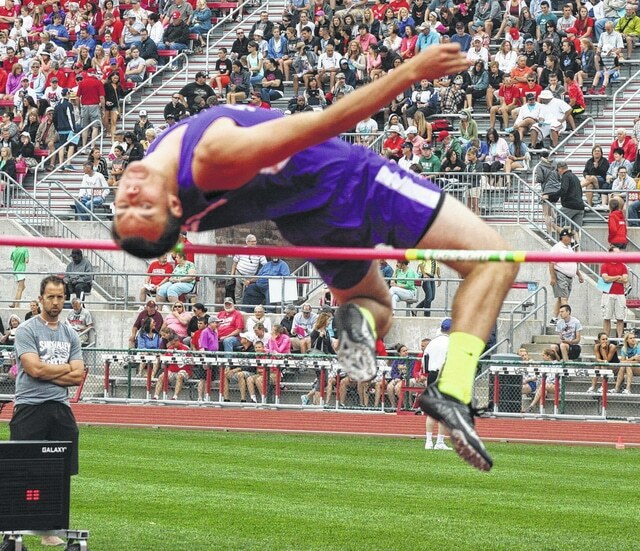 Swanton’s Gunnar Oakes gets over the bar at a height of 6 feet. He would later clear 6’2” on his second attempt to place 11th in the state for Division II. COLUMBUS – Swanton track and field sent a pair of athletes to the 2015 state meet this past weekend at Jesse Owens Memorial Stadium on the campus of Ohio State University. Both new to state competition, Swanton freshman Julia Smith made the podium in the high jump with a fourth place finish while sophomore Gunnar Oakes was 11th in the boys competition. In the Division II girls high jump, Smith finished fourth after clearing 5’4” on her second attempt. That leap was her best of the season and it came at just the right time. After getting league runner-up at the NWOAL meet at 5’2” back in May, she knew she had to put in a lot of hard work to have a better placement at state. “Coach (Tim) Spiess really helped me with working out and conditioning for getting this. Going every day and jumping, and working out in the weight room,” stated Smith. Clyde’s Paula Wollenslegel took home the championship in the event by clearing 5’7” on her second attempt. She beat out Yashira Rhymer-Stuart of Finneytown who cleared 5’7” in three try’s. In the boys high jump, Jeffery Floyd of Linden McKinley won by clearing 6’10” on his second attempt. Zach Robbins of West Branch was second at 6’9”. For the Bulldogs, Oakes was 11th after clearing 6’2” on his second try. The bar was then raised to 6’4” which would have been a personal best, however, he failed to clear the height in three attempts. Also in the area in Division II, Delta’s Tyler Fraker finished in a tie for third in the pole vault as he cleared 15’4”. “I was looking to be a little higher. But really I can’t be too disappointed. I moved up two places from last year,” said Fraker. He explained that it was a minor change that perhaps cost him a chance at placing second. Also for the Panthers, Bailey Storeholder was ninth in the boys 100 meter dash. It was his first appearance at the state meet. The Wauseon girls finished at a tie for 15th in the state as they notched 15 points. Senior Taylor Vernot led the way for them as she was fifth in the 1600 meter run and state runner-up in the 3200 meter run. For Evergreen, sophomore Alyssa Noe placed ninth in the 400m in Division III in her first trip to state.